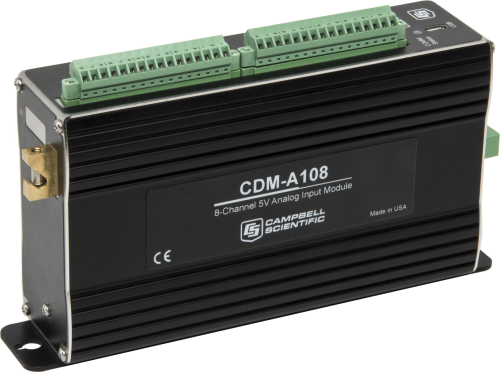 The CDM-A108 is an analog input module that allows you to easily expand your Campbell Scientific data logging system. The CDM-A108 features a 24-bit, analog-to-digital converter and a low-noise, analog front-end to provide you with superior analog measurements. This module also supports period average measurements and includes both current and voltage excitation channels. The CDM-A108 has eight differential inputs and two excitation channels. It provides both a 12 V and a switched 12 V port for powering your peripherals and two switched 5 V ports for peripheral control. The CDM-A108 offers 24-bit sigma-delta Adc with 16 user programmable notch frequencies from 30,000 Hz to 2.5 Hz, including 50 and 60 Hz. Previous generations of data loggers could notch out 50 or 60 Hz. -NOTE- Additional specifications are listed in the CDM-A108 and CDM-A116 brochure. CR1000 To use the CDM-A108 with a CR1000 datalogger, an SC-CPI (data-logger-to-CPI interface) must be used between the data logger and the CDM-A108. CR3000 To use the CDM-A108 with a CR3000 datalogger, an SC-CPI (data-logger-to-CPI interface) must be used between the data logger and the CDM-A108. CR800 To use the CDM-A108 with a CR800 datalogger, an SC-CPI (data-logger-to-CPI interface) must be used between the data logger and the CDM-A108. CR850 To use the CDM-A108 with a CR850 datalogger, an SC-CPI (data-logger-to-CPI interface) must be used between the data logger and the CDM-A108. Execution of this download installs the CDM-A108 / CDM-A116 Operating System on your computer which can then be uploaded to the CDM-A108 or CDM-A116 device with the Device Configuration Utility.